On Rosh Hashanah we eat apples and honey for a sweet new year. My question is, why specifically apples and honey? There are many sweet foods. Is there anything significant about them? There is a difference between the sweetness of an apple and the sweetness of honey. An apple is a sweet fruit which grows on a tree. There is nothing surprising about that—many fruits are sweet. But honey comes from a bee—an insect that is not only inedible, it actually stings. Nevertheless the honey that it produces is sweet. In fact, honey is sweeter than an apple! Similarly, there are two types of sweetness in our lives: we have times of family celebration, successes in our careers, personal triumphs and harmonious relationships. These are sweet times like the apple is sweet. But then there is a different type of sweetness; a sweetness that comes from times of challenge. When things don't go the way that we would like them to, when tragedy strikes, when our job is in jeopardy, when we fail to reach the goals we expected of ourselves, when our relationships are being strained and tested, when we feel alone. At the time when we are facing these challenges, they seem bitter and insurmountable, like the sting of a bee. But if we are strong and withstand the difficult times, and overcome the obstacles to our own happiness, we reveal layers of our personality that we would never have tapped into if we weren't challenged. Something deeper is brought out when we are tested. Tension in a relationship is painful, but there's nothing better than reconciling after that tension. Losing a job is degrading, but how often it is that we find bigger and better things to move on to. Loneliness can eat us up, but it can open us to higher levels of self-knowledge too. We have all experienced events in our lives that at the time were painful, but in retrospect we say, "Thank G‑d for the tough times—imagine where I would be without them!" So we eat apples and honey on the first day of the new year. We bless each other and ourselves that in the year to come the apples should bring sweetness, and what the bee stings bring should be even sweeter! Sweet Sting. Be sweet as apple and look sweet as honey. Eat what ever you like but don't eat bitter. Apples... When thinking too deep we often miss the obvious. According to the Torah (Devarim 32:10), we are the apple of His (HaShem's) eyes. ponder on that a bit. The Honey is His sweetness poured upon us. Apples and Bees In A Symbiotic Relationship Our souls strive to be in a relationship with HaShem. And HaShem wants us to find, praise and care for the beauty in the world that He has created. We have the ability to make HIs naturally sweet harvested fruit even sweeter when we dip the bees honey in a slice of apple at the New Year. HaShem gave us this gift of adding to His sweetness and saying a blessing for all that is good. Beautiful. Nice. Will print it out. I am very interested i judaism. My grqandmothers surname was Orella a sefardic surname. no way C'mon, admit it. You eat apples dipped in honey for no reason whatsoever. I don't buy any of this post. I'm from the southern US, and we eat blackeyed peas on New Years... also for no reason. Some kook just started the tradition, and it caught on, just like apples 'n honey. Or, maybe I could make up a reason too! The pea is a symbol of the beginning of life. As the pea sprouts, it grows into a glorious plant, sharing it's beauty with the world. We in the south see the new year as a new (or rebirth of a) chance to spread beauty to the world. Of course the pea has a black eye, signifying that some people don't appreciate beauty, and will punch you in the face if you try to display it. But like the mighty pea plant, we continue to spread our message of beauty. Apples and Honey I think that there are other significances that the article didn't discuss..
Apples are also a round food, which has special significance as symbolizing the "cycle of life." Rosh Hashanah signifies the beginning of a new cycle, both in Torah and in sustenance. Also one of the Shana Tova blessings is a blessing involving the "tree of life." Finally, apples have another symbolism in terms of knowledge and education. If In Rabbi David Cooper's book, G-d is a Verb, there is a quote, "when G-d loves a soul He tests it in order to bring it closer to Him." 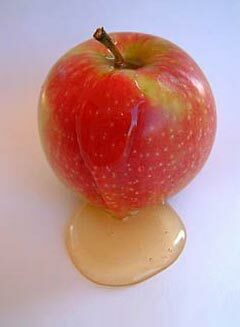 apples and honey What a beautiful commentary on why do we eat specifically apples and honey on Rosh Hashonah. I never quite knew myself and yet I and my adult children, have suffered in the loss of father, grandfather, and of course my beloved husband of 42 years. He was in education and is now in the realm of the Tzadikim buried in Har HaMenuchot in Givat Shaul outside of Jerusalem. (Rosh Chodesh Cheshvan 5762) at the age of 66. Fortunately we "did all of the things we wanted to do", traveled many times to Israel to visit the children and grandchildren, saw lots of wonderful simchas and met many wonderful young people who became observant just by eating at our Yom Tov and Shabbos table.